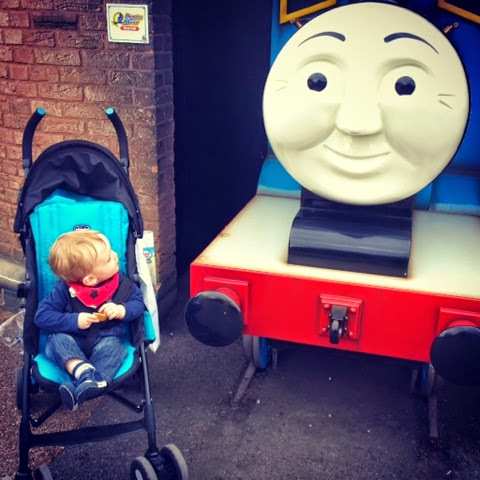 Ethan has recently discovered Thomas the Tank Engine and I had the chance to take him to Thomas Land at Drayton Manor this week as there's a new DVD, Tales of the Brave, and we were invited to a special screening (I'll be posting about our day out in full later this week). Obviously he's still quite young but Ethan's recognising and understanding thins more every day and we had such a great time together. He spent the whole day pointing and exclaiming 'choo choo!' At every opportunity. It was lovely to see him so excited and I just love this photo I managed to catch of him looking at Thomas. Very cute photo - love the look of shock and amazement on his face.